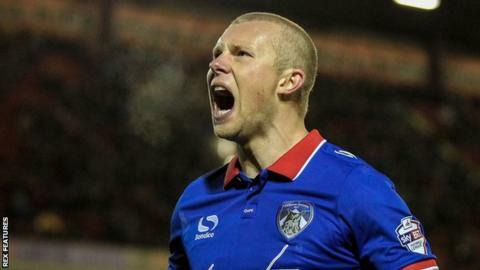 Oldham Athletic boosted their hopes of League One survival as Curtis Main's second-half goal sealed a vital three points against Southend United. Jonathan Forte hit the post for the visitors, who are six points above the bottom four, before Tareiq Holmes-Dennis sent an effort wide. Oldham keeper Joel Coleman saved a David Worrall shot at the other end. Main fired home after the hour mark as he latched on to Forte's pass to seal victory for the Latics. Oldham have a sizeable cushion above the League One relegation places with three games left to play, while Southend remain in 13th place. Match ends, Southend United 0, Oldham Athletic 1. Second Half ends, Southend United 0, Oldham Athletic 1. Attempt missed. Tyrone Barnett (Southend United) header from the centre of the box is close, but misses to the right. Corner, Southend United. Conceded by George Edmundson. Attempt saved. Tareiq Holmes-Dennis (Oldham Athletic) left footed shot from outside the box is saved in the bottom right corner. Attempt missed. Lee Croft (Oldham Athletic) right footed shot from the centre of the box is close, but misses to the right. Substitution, Southend United. Sam McQueen replaces Adam Thompson. George Edmundson (Oldham Athletic) wins a free kick on the left wing. Attempt saved. John White (Southend United) header from the centre of the box is saved in the top centre of the goal. Substitution, Southend United. Jamar Loza replaces Stephen McLaughlin. David Worrall (Southend United) is shown the yellow card for a bad foul. Brian Wilson (Oldham Athletic) is shown the yellow card for a bad foul. Lee Croft (Oldham Athletic) wins a free kick in the attacking half. Goal! Southend United 0, Oldham Athletic 1. Curtis Main (Oldham Athletic) right footed shot from the centre of the box to the high centre of the goal. Assisted by Jonathan Forte. Attempt saved. Cameron Dummigan (Oldham Athletic) left footed shot from outside the box is saved in the centre of the goal. Attempt saved. Jonathan Forte (Oldham Athletic) right footed shot from the left side of the box is saved in the centre of the goal. Attempt blocked. Jack Payne (Southend United) right footed shot from the centre of the box is blocked. Attempt blocked. Jack Payne (Southend United) right footed shot from the right side of the box is blocked. Corner, Southend United. Conceded by Anthony Gerrard. Attempt missed. Tyrone Barnett (Southend United) left footed shot from the centre of the box is close, but misses to the right. Timothee Dieng (Oldham Athletic) wins a free kick in the defensive half.